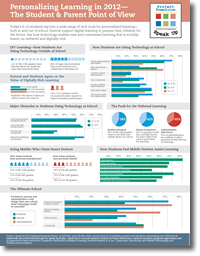 On April 24, 2012 Project Tomorrow released the report “Mapping a Personalized Learning Journey – K-12 Students and Parents Connects the Dots with Digital Learning” at a Congressional Briefing held in Washington, DC. Julie Evans, Project Tomorrow CEO, discussed selected student and parent national findings from the Speak Up 2011 report and moderated a panel discussion with students and parents who shared their insights and experiences. Parents’ definition of academic success for their children places a strong emphasis on learning the right skills to be successful (73%)- more than any other metric for success, including monetary success or getting into a good college. Project Tomorrow was very pleased to welcome staff from Adobe, American Association of School Librarians, American Federation of Teachers, Arizona Department of Education, Arlington County Public Schools, Baltimore City Public School System, Baltimore County Public Schools, Blackboard, Inc., Committee on Health, Education, Labor and Pensions, Digital Learning Experience, Discovery, Education Free Agent, e-luminodity, Fairfax County Public Schools, Institute of Museum and Library Services, Intel Corporation, K12, Inc., Kajeet, Maryland State Department of Education, Maryland Society for Education Technology, National Association of State Directors of Special Education, Inc., National Association of State Boards of Education, National Board for Professional Teaching Standards, National Education Association, National Museum of American History, National Commission on Teaching & America’s Future, Oracle, NASA/GSFC, Nogales Unified School District, Qualcomm, Senate HELP Committee, Software & Information Industry Association, SMART Technologies, State Education Technology Directors Association, TIES, US Department of Education, US House committee on Education, US House and US Senate. Students and parents from Arlington Public Schools (VA), Fairfax County Public School District (MD) and McKinley Technology High School (DC) shared their insights regarding personalizing their own learning.